Ladies, you know that your guy loves you, although there are times when it might look as though this is not the case. He does, he really does. He can be really thick at times though, so we are extremely appreciative of your efforts in understanding him and letting him catch up with your thought processes afterwards. 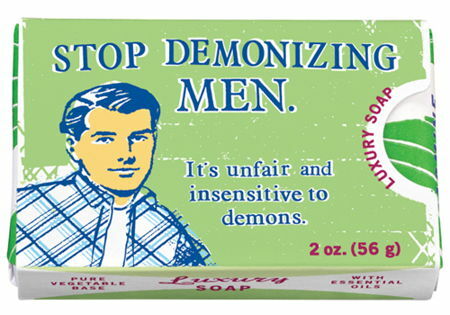 Still, those are no reasons to demonize your man, and if you happen to know a lady who seems to have had her life turned upside down by one lousy example of a guy, leading her to become a one woman crusade, slow down her male bashing tendencies with this $3.99 Stop Demonizing Men Soap. Hopefully, it will be able to wash away some of the hurt feelings of the past.